Head over to the Minnesota Zoo and travel back in time. Back to a time when dinosaurs roamed the earth. 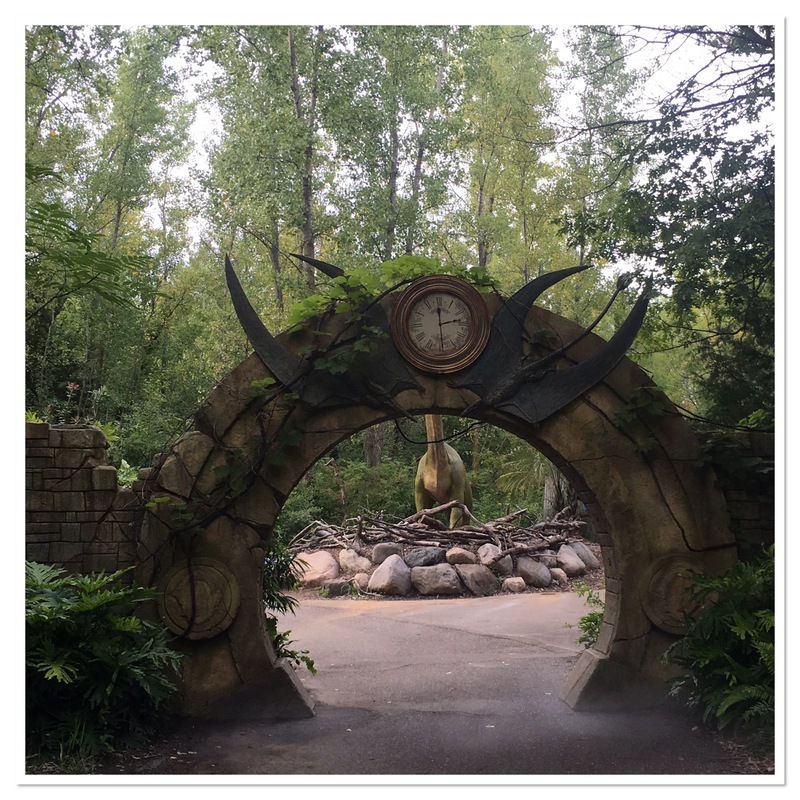 The kids and I took the journey and here’s what we saw. The walk is long. Especially if you are just heading to the zoo to see the dinosaurs. It’s located in the far back past the farm. As you are walking the hilly path to the entrance you start to see things changing. Soon you stumble upon an ancient opening to the land of the dinosaurs. Right there at the entrance is your very first dinosaur! I like how they put a tame, gentle dinosaur to start the exhibit. It makes the exhibit more welcoming for little ones. Plus, any little kid that loves dinosaurs, knows this a gentle herbivore. And they may even refer to him as Little Foot. At least, Peyton referred to him as Little Foot. 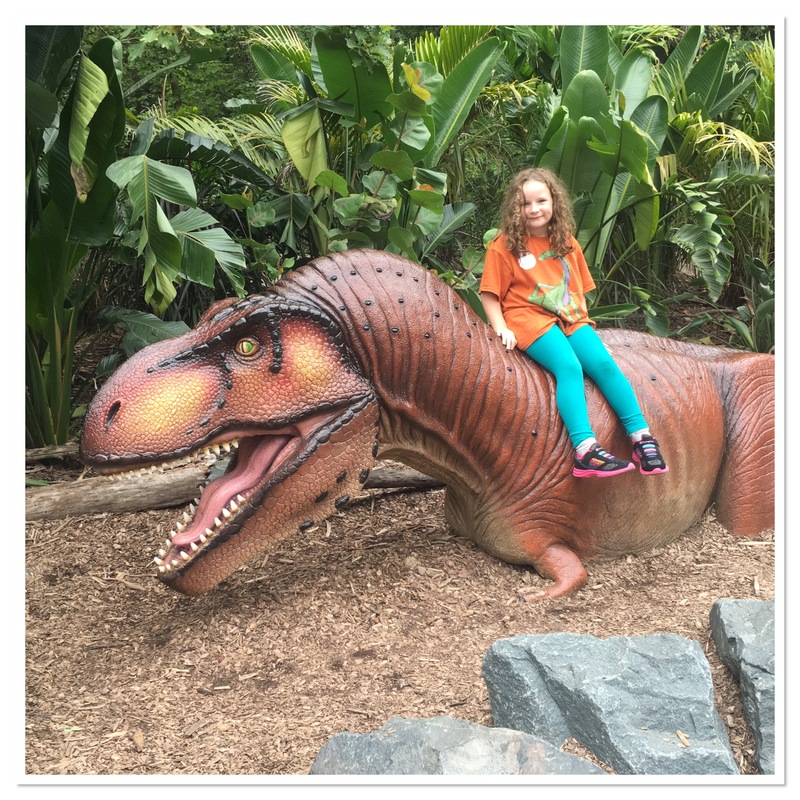 She was super excited to see her favorite dinosaur from the Land Before Time standing before her. 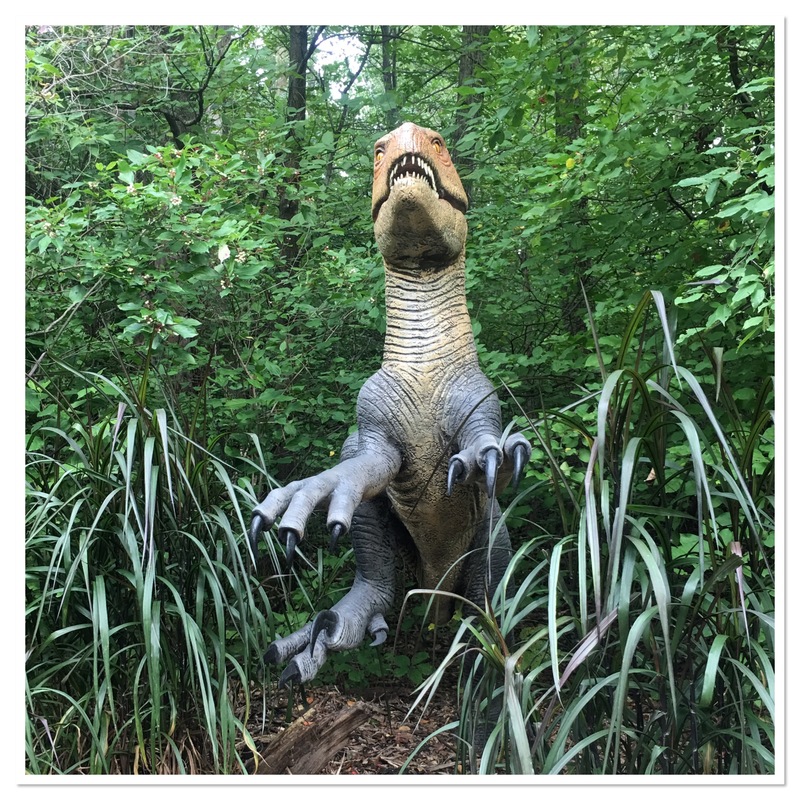 The second dinosaur is not so friendly! He looks like he’s creeping through the mist and is going to eat us. We didn’t stick around to find out. 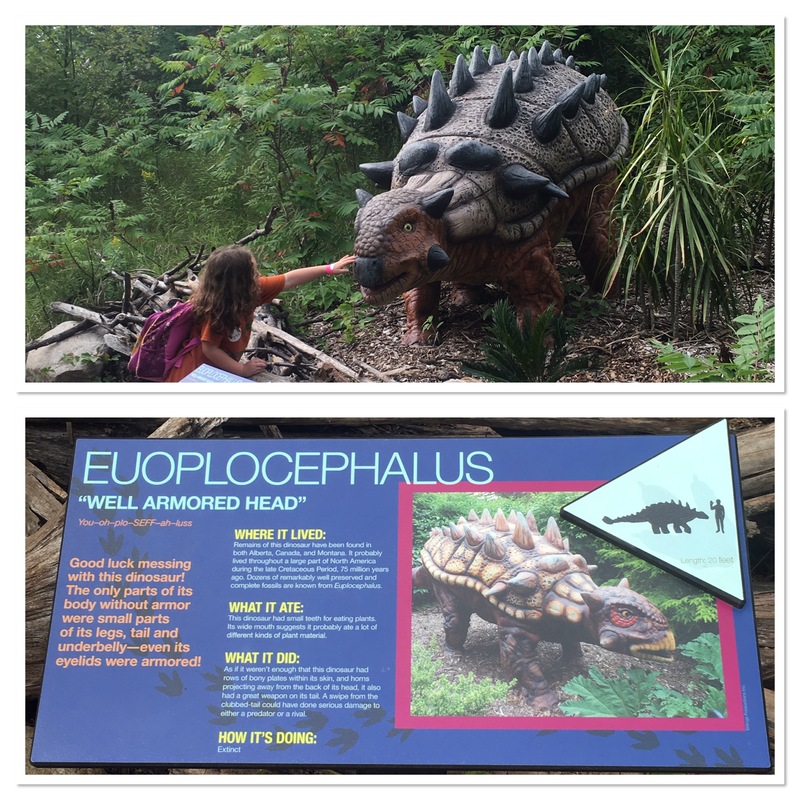 Next up was a spiky dinosaur, Euoplyocephalus. I found it interesting that this dinosaur once lived in Montana! This was also a plant-eating dinosaur but he was well protected with his armor, so he didn’t worry about meat eaters often. 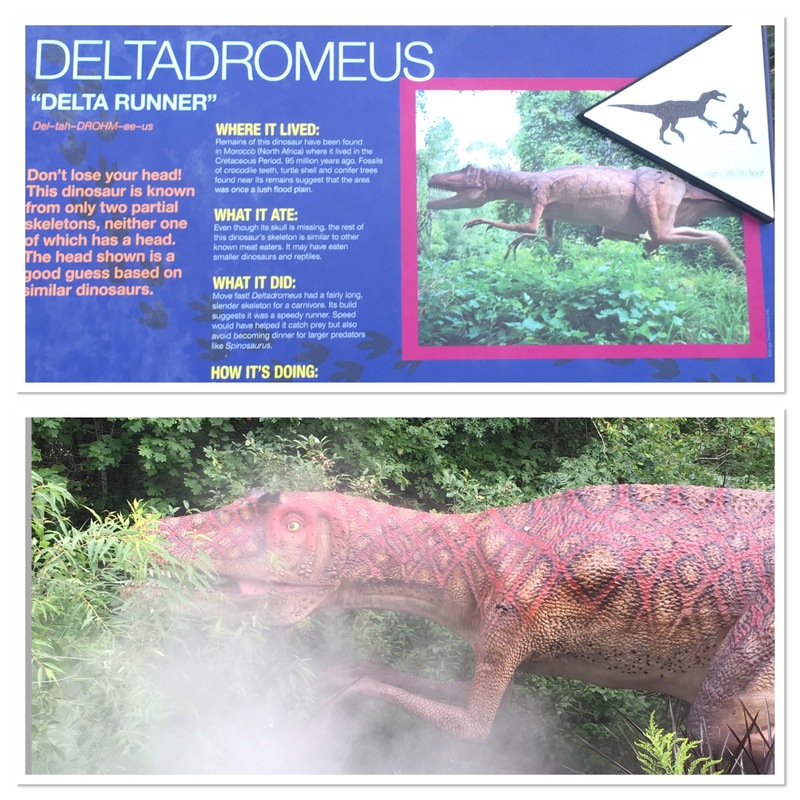 Then we ran into a Deltadromeus also known as a Delta Runner. The Delta Runner has been found mostly in North Africa. And because we’ve never found a complete skeleton, scientist have guessed on what the head looks like and assumed he is a meat eater. I wouldn’t want to run into him! Remember this guy from the movies? Peyton immediately recognized him. 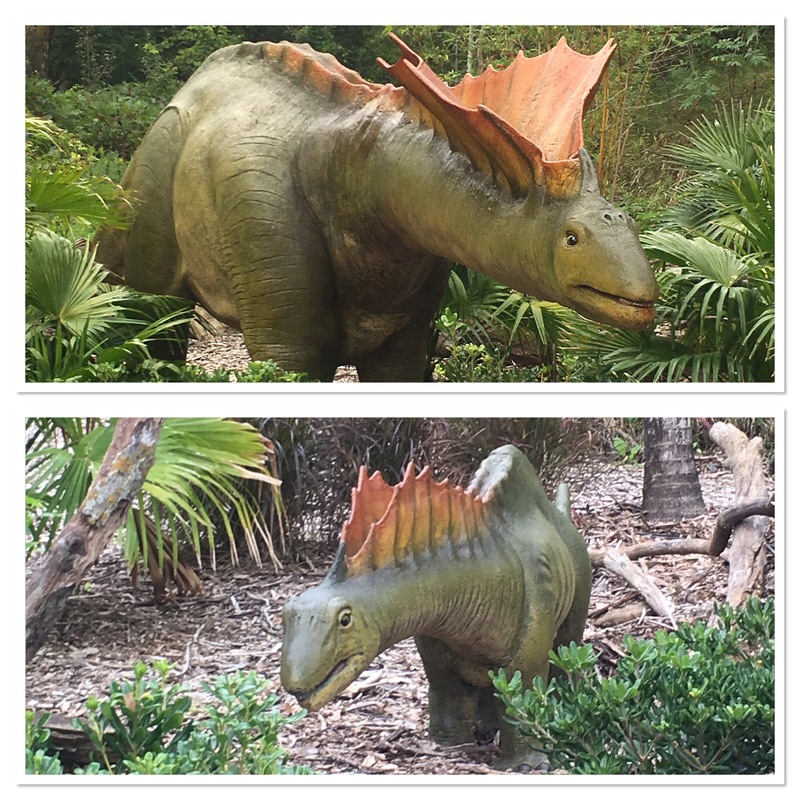 the Styracosaurus is another name for spiked lizard. And he must have liked the cold because he used to live in Alberta Canada! 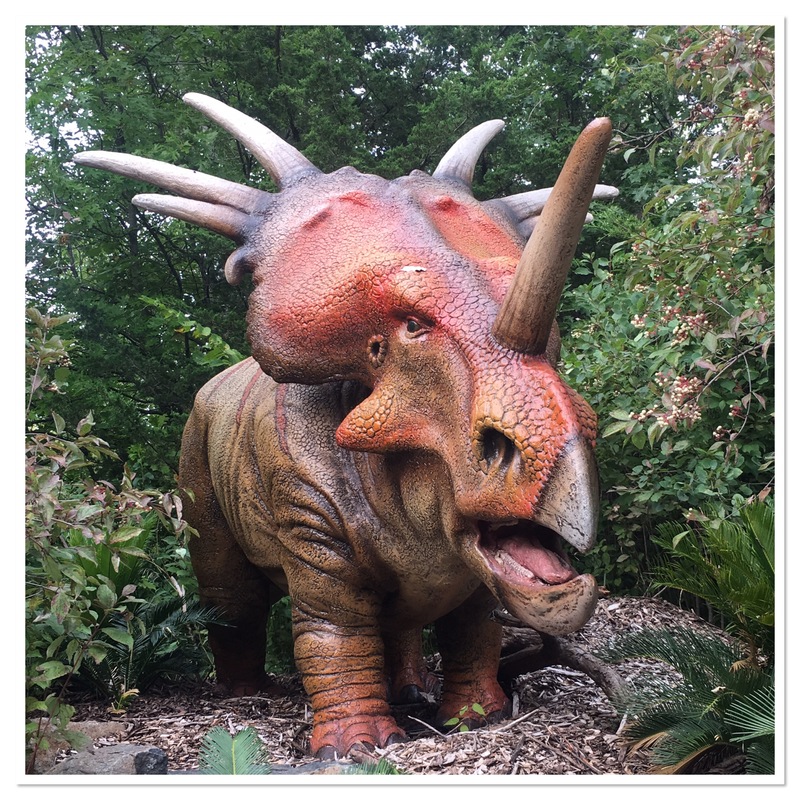 The Styracosaurus is also a herbivore. Wow! We stumbled into the middle of a Mama dinosaur protecting her young! 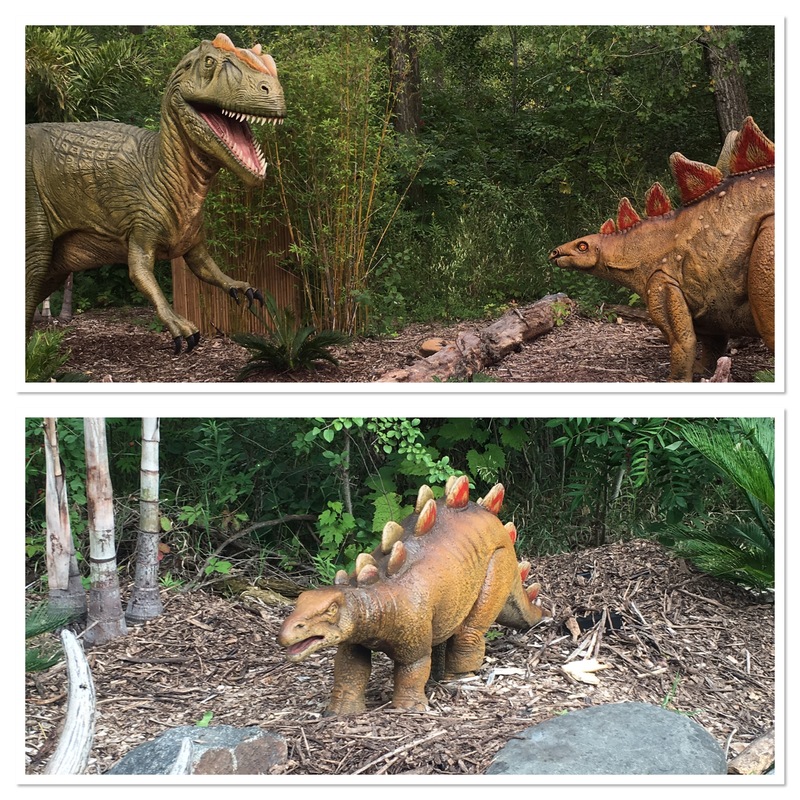 A mama Stegosaurus was defending her baby from an Allosaurus. The Allosaurus is known for eating other dinosaurs and having a fondness for Stegosauruses. There have been fossils found of the Allosaurus with puncture wounds that match a Stegosaurus. The Allosaurus has been found mostly in North America. But the Stegosaurus has been found in North America and Portugal. 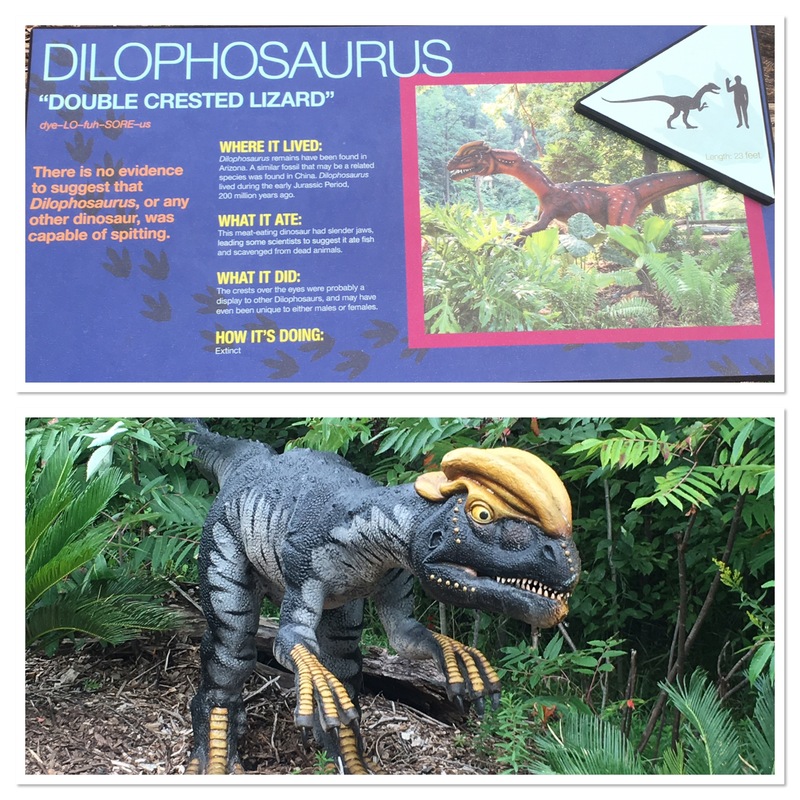 As we rushing out of the battlefield we ran smack dab into a Dilophosaurus! You’ll want to be careful when crossing his path because he spits! Scientist believe he was a fish-eating dinosaur but fossils have been found in Arizona. Makes you wonder what the Earth looked like 200 million years ago that a Dilophosaurus could find fish in what is now a desert. After escaping the spitting dinosaur we found a mama Amargasaurus with her baby. They were so cute! These guys have been found in Argentina and liked to eat plants. What a unique dinosaur with spiney weblike horns. As we were wandering down the path, we came to a marshy area. Be aware of your surroundings! 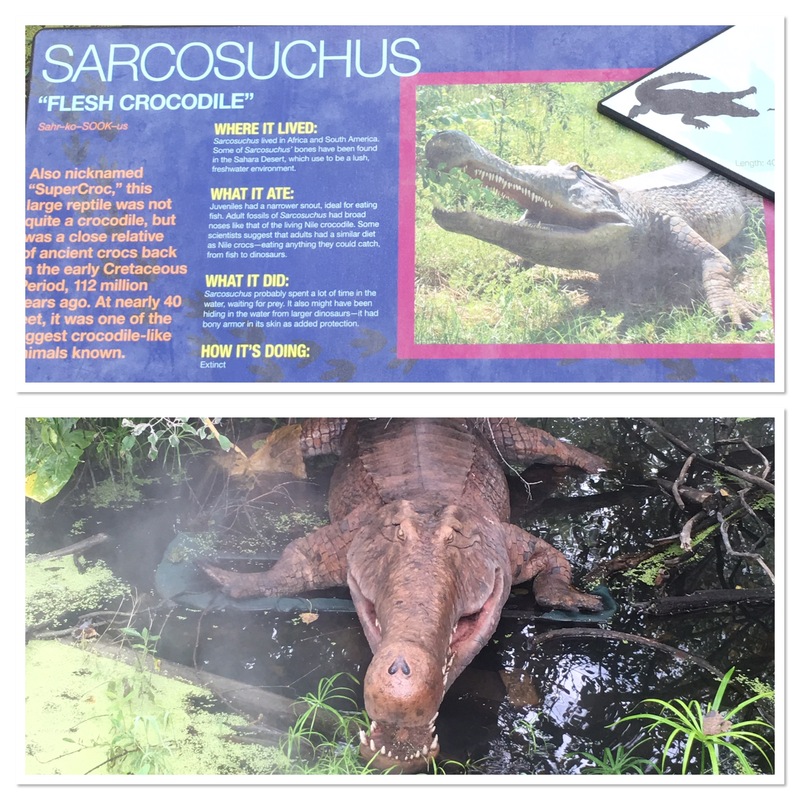 There was a Sarcosuchus lurking!! The ancestor to alligators and crocodiles was right before us. With his armor like skin he was hiding, looking for his next meals. He doesn’t seem to be choosy, he just wants fresh meat. It feels like we’ve stumbled upon a bunch of predators! 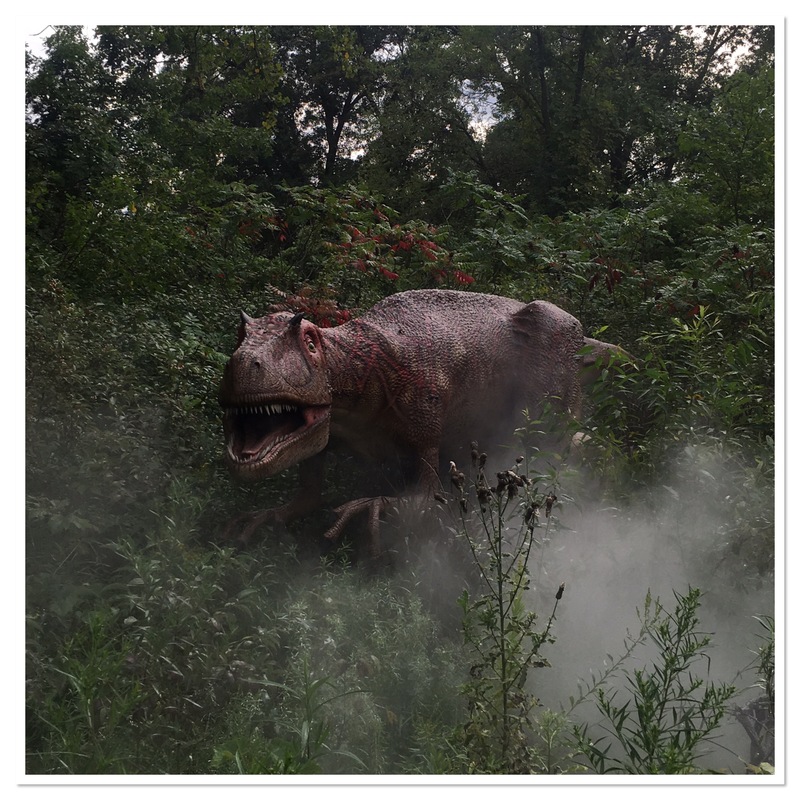 The Cryolophosaurus was only a few feet away. Maybe the Sarcosuchus was hiding from him?? Can you believe he used to hang out in Antarctica? I know the climate was different millions of years ago but I still imagine it was cool up there! It’s said Cryolophosauruses ate other dinosaurs. 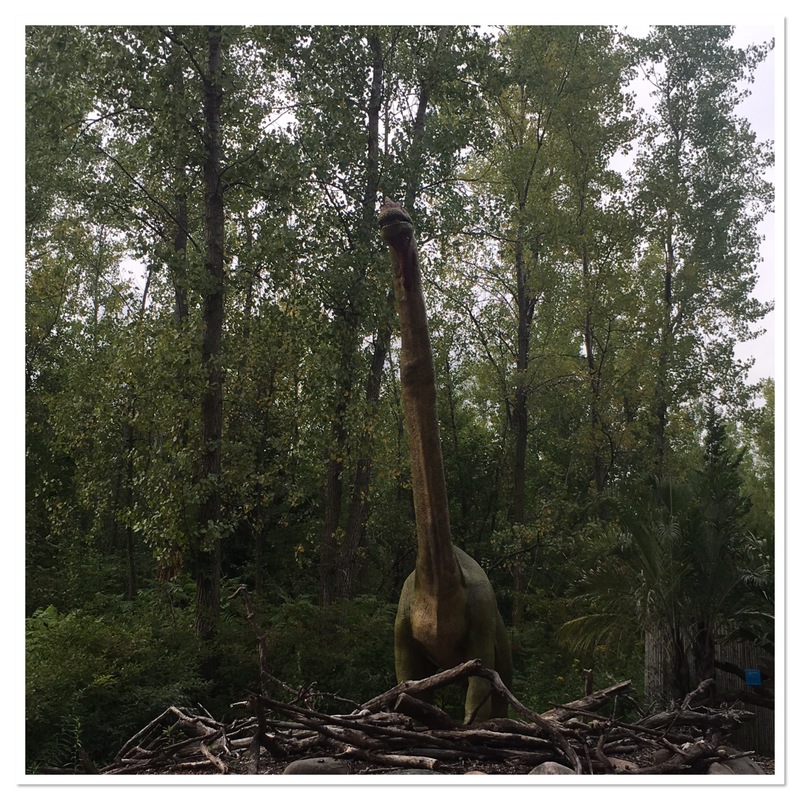 Maybe even the long neck dinosaur we saw when we first entered! Run Little Foot! 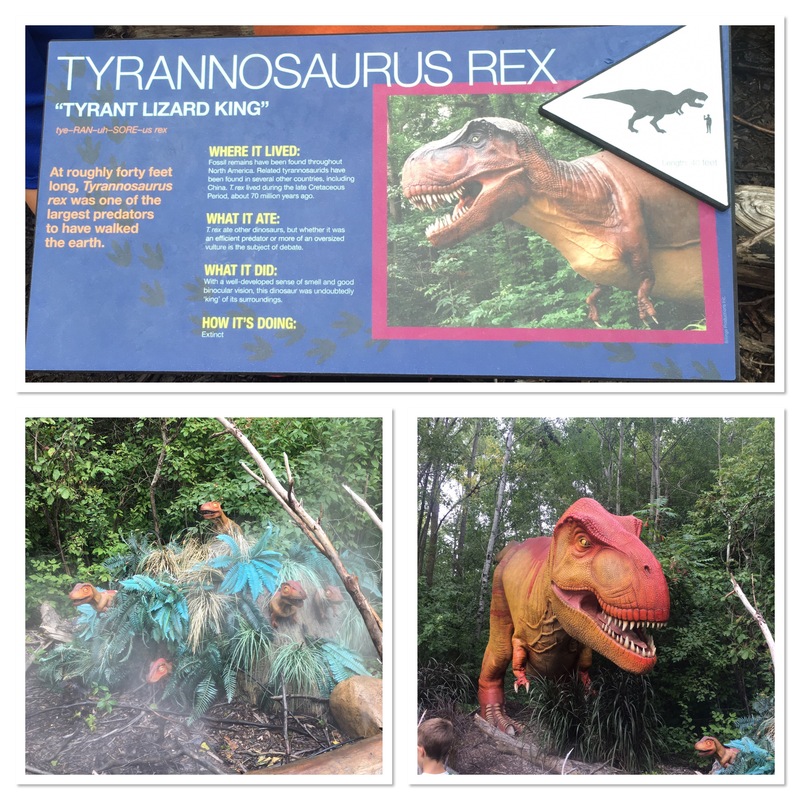 As we are trying to make it out of this dangerous area of the park we stumbled upon a Tyrannosaurus Rex and her babies! We made sure not to get in between mama and her babies. Then we turned the corner and there was this guy! With long talons and sharp teeth I think I’m more afraid of him than a T-Rex. He’s a Deinonychus and used to live all around us! Especially in Utah, Montana, Wyoming, Oklahoma and Maryland. Guess what he liked to eat?? Other dinosaurs! But, he only ate the small to medium size ones. I guess the big ones were too much of a challenge. And then we were done! Into the play area and gift shop we went. The dinosaur exhibit was fun. Both kids enjoyed themselves a ton. 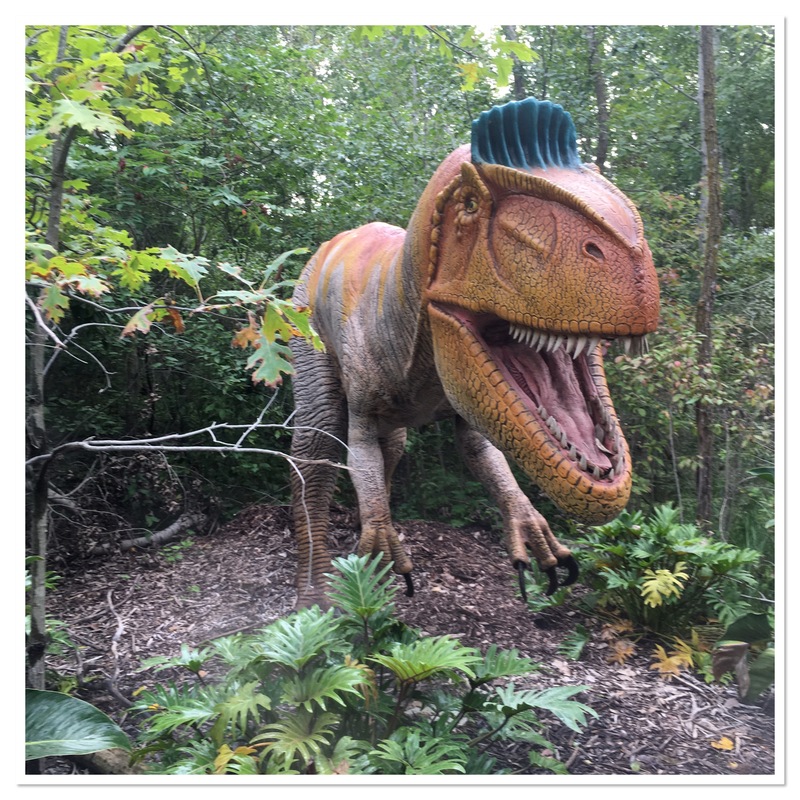 Some of the dinosaurs move and some make noise. You just never know what you’ll get. And as you’re leaving, heading back to our time, there’s a little surprise. But I’ll leave it up to you to see what it is.